Who comprise the May Family? 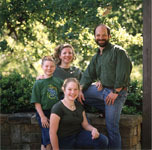 The May Family is a domestic unit comprised of the individuals Herman, Elizabeth, Rebecca, and Collin. Our terrestrial domicile is located in the city of Garland, Texas  a suburb of Dallas. We have lived in our present home for fourteen years (as of April 2007). Herman is employed at the University of Texas Southwestern Medical Center as Senior Research Associate for the Molecular Cardiology research lab of Joseph Hill. More information is available at his personal website. Elizabeth is employed as the Team Lead for Solutions Support at Bombardier Aerospace — FlexJet. Our children, Rebecca and Collin, are currently being molded for eventual release into the world at large. Rebecca has recently fledged and is in her first year of higher education Tyler Junior College where she is majoring in psychology. She also maintains personal webspace at Facebook and, to a lesser extent, MySpace; I am sure she would enjoy a visit if you are so inclined. Collin is a member of the eighth grade at Saint Paul the Apostle and enjoys playing volleyball. As of this fall, he is also learning to play the guitar. In addition to the four representatives of H. sapiens, our household contains two felids (Marcus and Aurelia), two canids (Oberon and Catalina) and several fresh water fish.